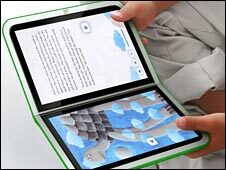 Constant Flux › Is The XO-2 The Ideal Electronic Book? On a related note, what are they teaching kids these days? This was written by Gustav Bertram. Posted on Tuesday, July 1, 2008, at 10:35. Filed under Book, Computing, Education, Entertainment, Inventions, OLPC, Technology. Bookmark the permalink. Follow comments here with the RSS feed. Post a comment or leave a trackback.